I was writing the schema introspection code for Zend_Ldap when I came around a problem with Active Directory’s MaxPageSize restriction. By default Active Directory allows only 1000 items to be returned on a single query, a number which is easily exceeded when reading an Active Directory’s classes and especially attributes from the schema tree. OK – one option would be to increase the MaxPageSize variable, but as the component should be usable on every Active Directory server I couldn’t go for that. The second option that seemed possible makes use of the paged result sets that Active Directory returns on a query. This way led me into the world of LDAP server controls and deep into the ext/ldap source code. There is astonishingly little information on the topic of paged result sets and LDAP server controls in respect of PHP and ext/ldap. To be honest I assume that only one person really looked into this area seriously and even came up with a solution: Iñaki Arenaza (Blog, Twitter, Facebook, LinkedIn). His information provided here is the foundation of this article – the discoveries are absolutely not my work, they are all based on what Iñaki Arenaza dug out. I just wanted to bring a little light into this very specific topic (and summarize what I’ve answered on stackoverflow.com). To make it short right from the beginning: it’s currently not possible to use paged results from an Active Directory with an unpatched PHP (ext/ldap). Let’s take a closer look at what’s happening. This allows us to send a paged query to the LDAP/AD server. But how do we know if there are more pages to follow and how do we have to send a query to get the next page of our result set? As you see, the only option to make all this work, is to mess with the ext/ldap source code and compile your own extension. Iñaki Arenaza provides several patches that can be applied to the PHP source to make patching a lot easier. The patches can be found here (last one for PHP 5.2.10 from June 24th 2009) and there is an accompanying blog post available. Iñaki Arenaza even opened an issue in the PHP bug tracker on September 13th 2005 offering his help – but there has been no reaction from the developer’s side. What a great pity. It could have been so easy, if…, yes if only the PHP developers considered applying the available patch to the ext/ldap source code. Matthias Willerich just picked up my proposal to remove XML nodes from a XML tree when using SimpleXML which I wrote some time ago on stackoverflow.com and posted a small how-to on Content with Style. Nice to know that this idea proved helpful. After some last modifications to make the original Zend_Ldap tests pass with the new extended Zend_Ldap classes, the ZF teams has promoted the component to the standard trunk. I assume that we’ll have a public release of the code with the 1.9 version of Zend Framework. After Ralph Schindler (member of the Zend Technologies Zend Framework team) reviewed my Zend_Ldap extensions and successfully ran all unit tests, the last hurdle the component has to pass is the documentation. Currently the documentation is somewhat rudimentary but I think we’ll get the docs ready until the 1.9-release. It’s been a long way for this component but at last I think we can have a GO for moving the component to trunk shortly. 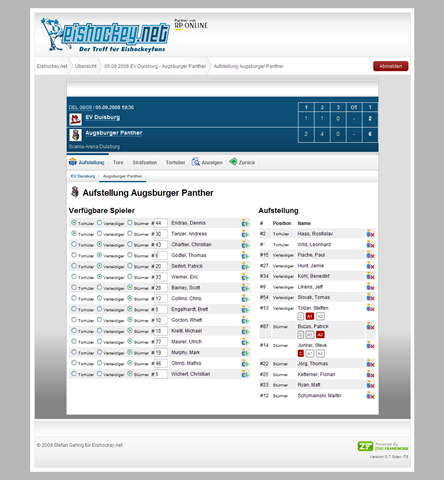 Currently I’m helping out Eishockey.net with a web-application to allow for the presentation and management of game sheets for the regional ice-hockey leagues in North Rhine-Westphalia. 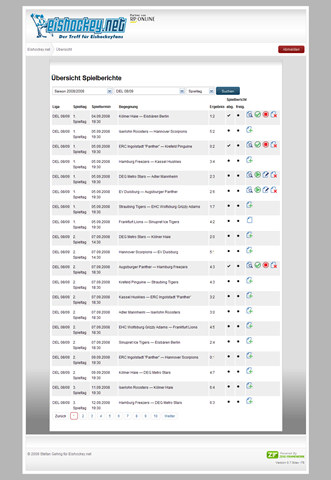 The public part (viewing game sheets, showing statistics) will be integrated in a Joomla installation running JoomLeague, which is a league management module for Joomla. 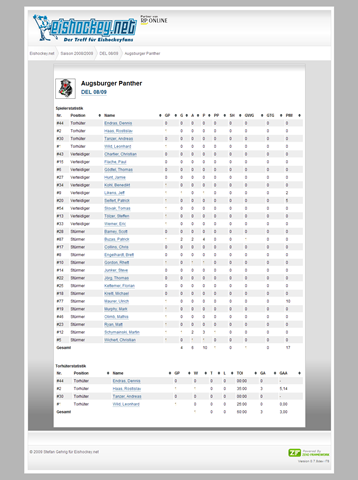 The internal part (creating, editing and managing game sheets) is a stand a lone application. The application is fully build on Zend Framework and uses its MVC component. Authentication is handled by Joomla itself and is provided via a proxy-script. 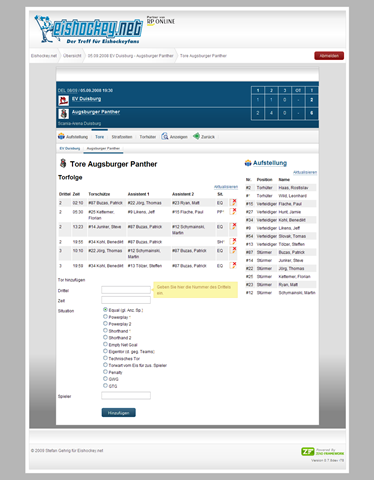 The underlying database is tightly integrated into the JoomLeague database to use its resources (teams, schedules, players and so on). However the application only reads from those resources and writes to its own tables only. This minimizes the impact an installation has on the core components. I put together some screenshots to give some impression about the application that will (hopefully) come online in August this year. At this point in time the application is feature complete and only some minor things like “top-20-scorer in the league xy” are missing. 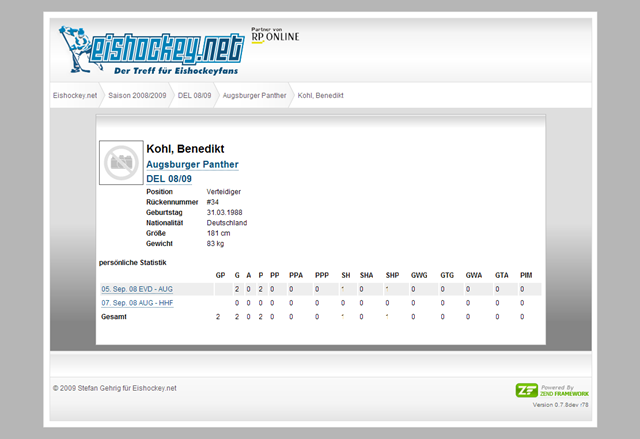 It’s up to the guys at Eishockey.net to get the thing online now. The set of available languages, country/region codes, and code pages includes all those supported by the Win32 NLS API except code pages that require more than two bytes per character, such as UTF-7 and UTF-8. If you provide a code page like UTF-7 or UTF-8, setlocale will fail, returning NULL. The set of language and country/region codes supported by setlocale is listed in Language and Country/Region Strings. That means that setlocale() does not work on Windows when given a locale with an UTF-8 charset, e.g. German_Germany.65001, and therfore you cannot use strcoll() or similar functions for locale-aware string operations with these charsets. It simply is not possible due to a Windows CRT limitation. There is no change from the old Zend_Ldap – provide the options to connect to the server and call bind(). To retrieve a single entry from the server you use the getEntry() method. You can retrieve a list of entries that match a given LDAP filter by using the search() method. Instead of using a filter string you can create your filter with the object-oriented interface of Zend_Ldap_Filter. DN strings can be parsed into Zend_Ldap_DN objects which allow for easy modifiation of the DN. Zend_Ldap provides an add() method to add entries to the directory. The update() method can be used to update existing entries in the directory. Deletions can be done recursively when providing true as the second parameter. Zend_Ldap provides methods to move and copy entries and subtrees to other locations within the directory tree. The third parameter specifies if the operation will be carried ou recursively. There is a lot more to be discovered in Zend_Ldap such as checking server capabilities via the RootDSE, browsing the schema using the subSchemaSubentry, LDIF im- and exporting and especially the active-record like interface to LDAP entries Zend_Ldap_Node which we’ll cover in the next post. I hope this post has provided some insight into the features of Zend_Ldap and you’re invited to try and test the new features and give your feedback to further improve the component and get it into production, which means into the standard trunk, as soon as possible. Especially I’m in search for testers who can verify the working of this component against the different LDAP servers available: e.g. ActiveDirectory, ADAM, Siemens, Novell, Sun, and so on.